Storing all of your favourite fresh and frozen foods is easy with this 18.7 cu. ft. bottom-freezer refrigerator with reversible freezer door. You'll be able to keep everything at the right temperature thanks to the Accu-Chill temperature management system, which uses built-in sensors to activate the compressor only when necessary. Plus, SpillGuard glass shelves help contain leaks and spills in your bottom-freezer refrigerator for quick cleanup. And to keep fruits and vegetables tasting great, the FreshFlow produce preserver helps keep produce fresh longer. This 14.7 cu. ft. LG counter depth fridge is a perfect addition to any modern kitchen space. Equipped with the LG linear compressor, it features a quiet and energy efficient operating system and better durability than competitor models. Because the linear compressor motor uses fewer moving parts and operates more efficiently, LG confidently backs it with their 10-year warranty. 18.7 cu. ft. Refrigerator with Bottom Mount Freezer and Accu-Chill System in White - ENERGY STAR® Storing all of your favourite fresh and frozen foods is easy with this 18.7 cu. ft. bottom-freezer refrigerator with reversible freezer door. You'll be able to keep everything at the right temperature thanks to the Accu-Chill temperature management system, which uses built-in sensors to activate the compressor only when necessary. Plus, SpillGuard glass shelves help contain leaks and spills in your bottom-freezer refrigerator for quick cleanup. And to keep fruits and vegetables tasting great, the FreshFlow produce preserver helps keep produce fresh longer. 18.7 cu. 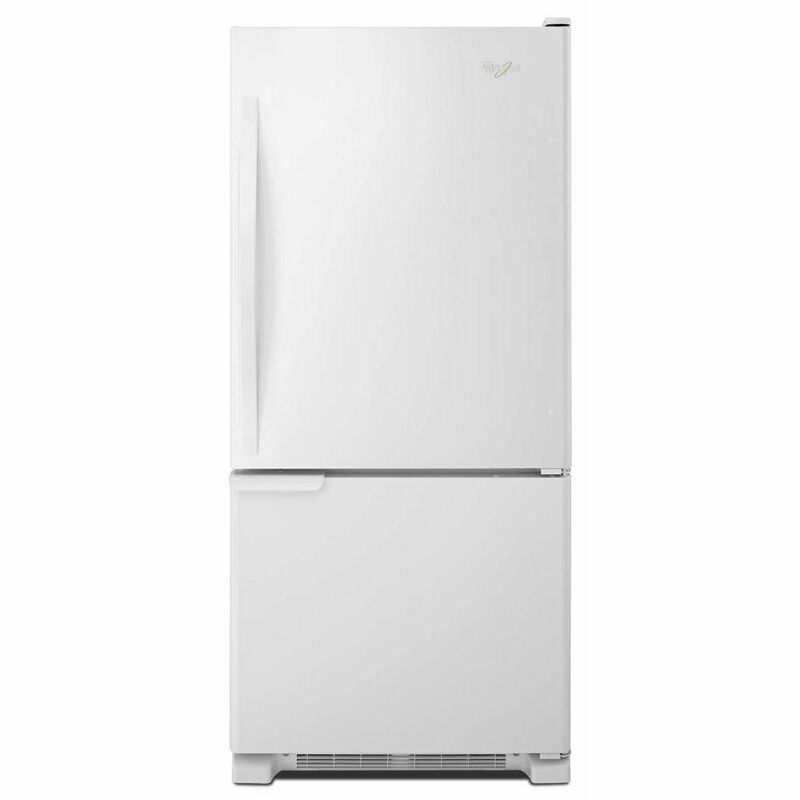 ft. Refrigerator with Bottom Mount Freezer and Accu-Chill System in White - ENERGY STAR® is rated 4.5 out of 5 by 538. Rated 4 out of 5 by Crystal from Great fridge but the door suction is so sticky. The... Great fridge but the door suction is so sticky. The entire fridge shakes when you open it. what is a single ice maker. also I do not see an ice bin in the freezer compartment in the picture display. it says it has a single ice maker in the add ,is this correct. Hello thank you for your question. This model has an optional icemaker that you can order separately part number IC13B. A single icemaker refers to the one icemaker available on this model. Sometimes there can be one icemaker in the freezer and one in the fridge compartment.